A Bald Eagle flies over Little Merganser Lake in Danbury, Conn., Sept. 2016. I live on Merganser Lake (real name Lake Waubeeka). A short walk away, down a trail that starts at my backyard, is Little Merganser Lake (really the Beaver Pond.) I like Little Merganser Lake because it is completely undeveloped and isolated. A wide variety of wildlife, mostly birds, can be seen at the lake and pond, but the pond is more productive because of its relative remoteness. I’ve seen some pretty good ducks and herons down there, but today I saw a Bald Eagle there for the first time. I heard it calling and then it soared overhead. It was impossible to miss. 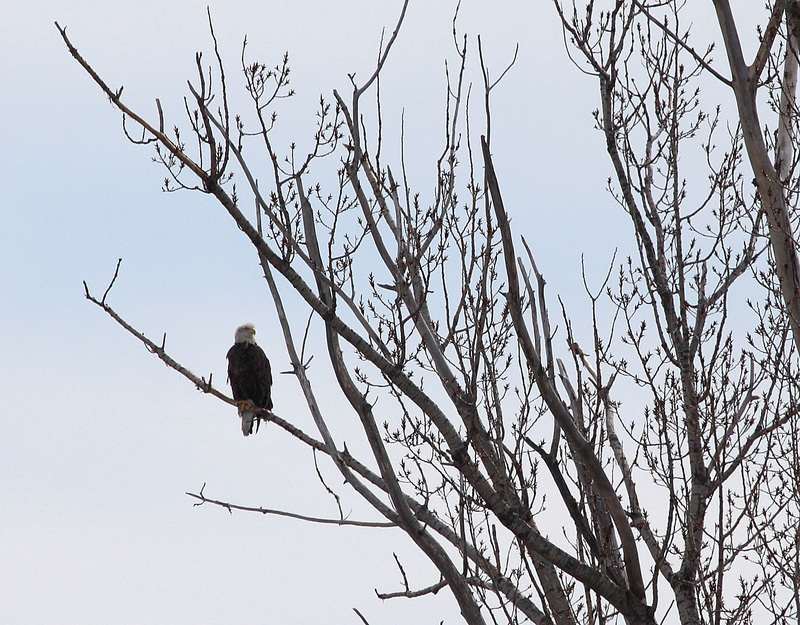 Bald Eagles are becoming more and more popular and nest on nearby lakes such as Candlewood and Lillinonah. So to see one here is not overly surprising, but as I said, it was first time seeing one, so of course I have to post about it. The eagles that were sitting on the nest on Chimon Island off the coast of Norwalk, Conn., earlier this spring have abandoned the nest. It’s sad news, but it’s not uncommon for birds of prey to fail in their first attempt at a nesting sight. Hopefully they will try again nest year with better results. Here’s my story in The Hour. Did the Norwalk eagles have babies yet? Rick Potvin, manager of the Stewart B. McKinney NWR, holds a sign before it was posted on Chimon Island on Wednesday. The U.S. 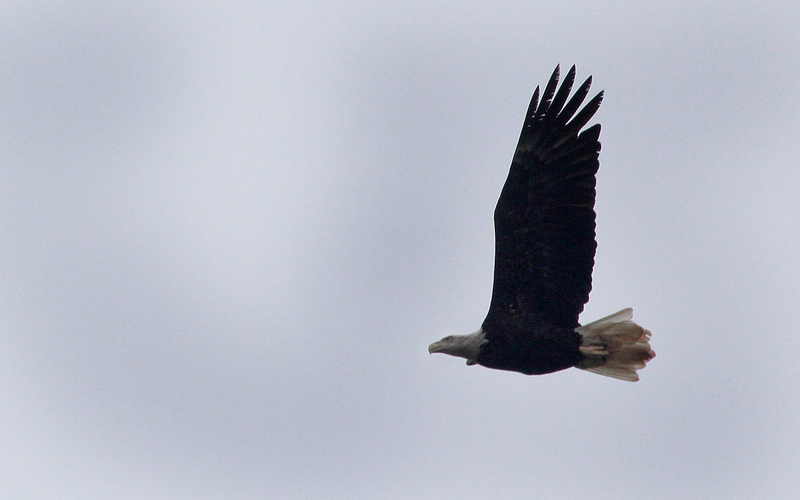 Fish & Wildlife officials were on the island to mark off areas to protect a bald eagle nest. I wrote my latest For the Birds column in The Hour newspaper (Norwalk, Conn.) about the topic. Now for the answer to the burning question in the Norwalk birding world: Most likely. 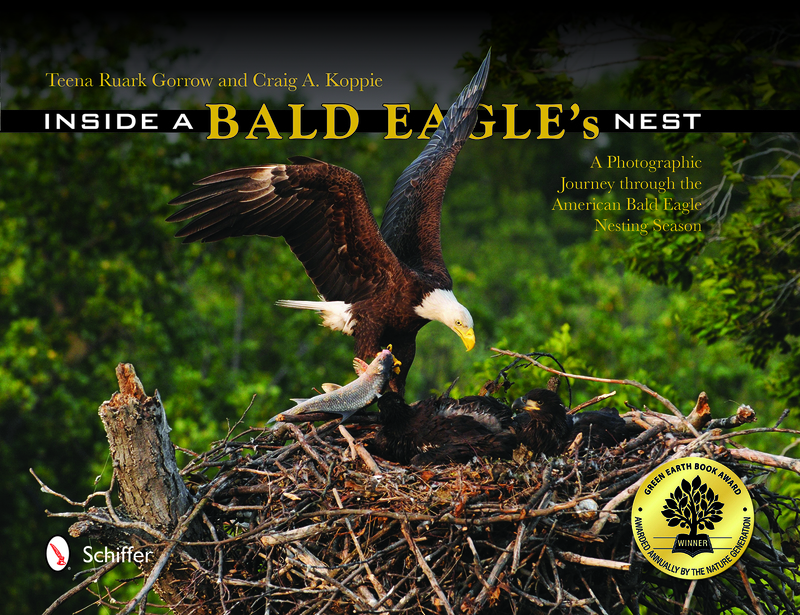 The question, of course, is: Did the Bald Eagles have babies yet? Again, the answer is “most likely.” Without climbing the tree or somehow hovering above the tree on Chimon Island where the nest is located, it’s hard to tell with all certainty. Since no one is going to climb the tree or otherwise hover above it, it’s basically a waiting game. The eagles are still out there and one is sitting on the nest at all times. You could see that from Calf Pasture Beach with a spotting scope or good pair of binoculars. In talking with Norwalk’s Larry Flynn, the eagles have been sitting on the nest long enough that eggs would have been laid and hatched by now. Flynn is monitoring the birds for the state DEEP. The vantage point from Calf Pasture and, indeed, even closer from Long Island Sound, is such that only the adult eagle’s head and maybe part of its body is visible. There is no way to tell what, if anything, it is sitting on. A Bald Eagle preches in a tree on Chimon Island off the coast of Norwalk, Conn., March 2015.
what we’d see anyway, but the confirmation has officially been made. The U.S. 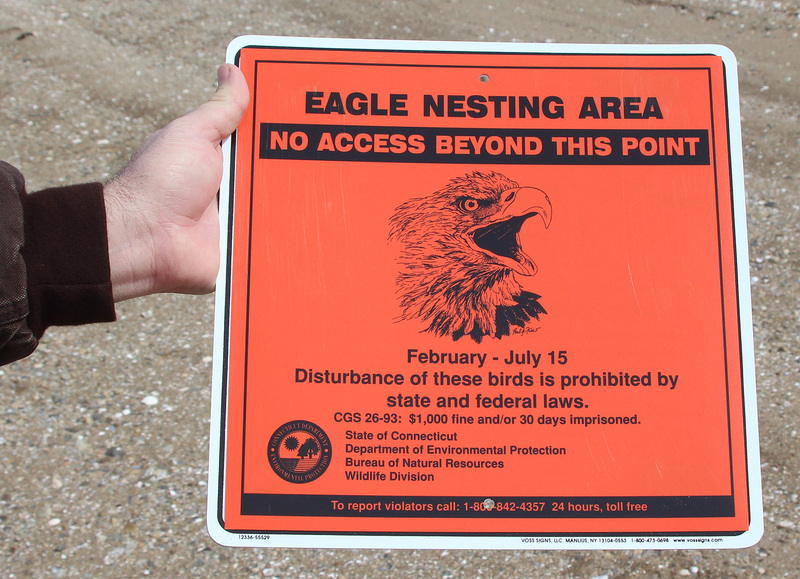 Fish & Wildlife staff posted more signage on the island and placed additional barriers to protect the eagles, which are safeguarded by state and federal laws. Chimon Island is part of the Stewart B. McKinney National Wildlife Refuge. Ospreys, so a battle may be pending. 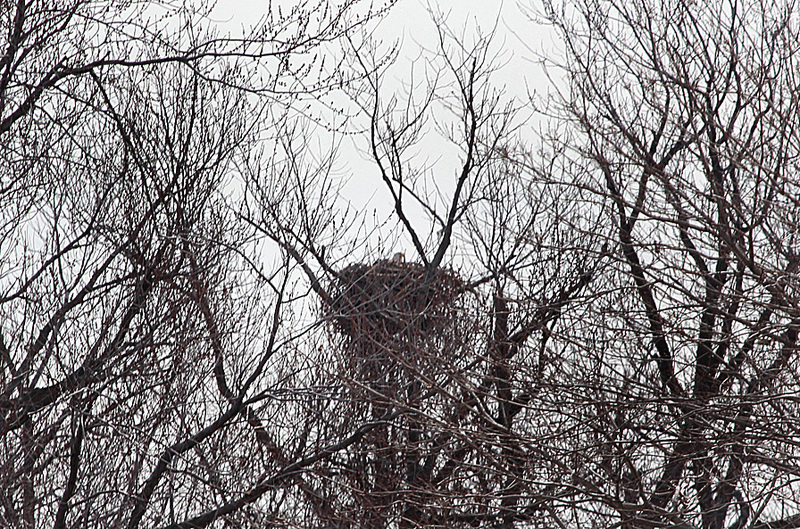 The eagles have taken over a nest that has been used by an Osprey pair for the last four years. The osprey haven’t returned from South America yet, so it could get interested when they do. 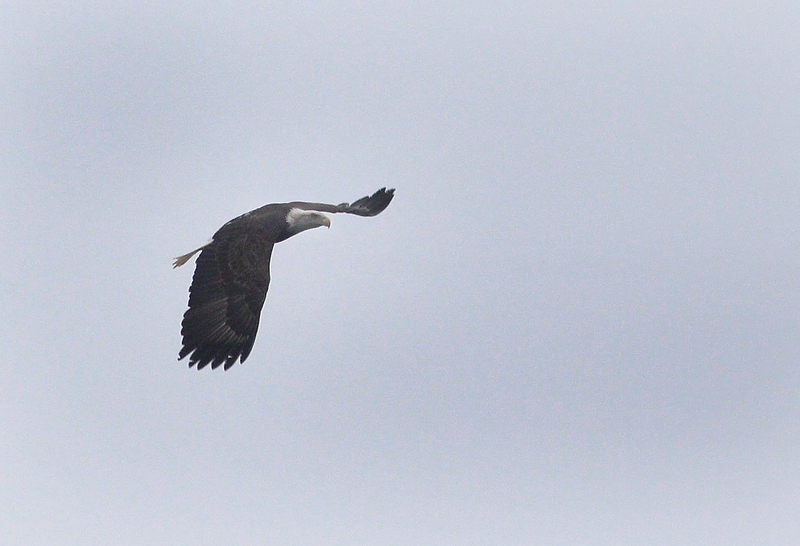 The photos aren’t great, I know, but they are indeed the eagles off the coast of Norwalk. Here are links to some stories I wrote for The Hour newspaper regarding the eagles. For the Birds: Have the eagles landed?